In A Way with Words: Writing, Rhetoric, and the Art of Persuasion, esteemed professor Michael D.C. Drout brings his expertise in literary studies to the subject of rhetoric. From history-altering political speeches to friendly debates at cocktail parties, rhetoric holds the power to change opinions, spark new thoughts, and ultimately change the world. The study of rhetoric not only leads to a greater understanding of how personages such as Martin Luther King Jr. and Winston Churchill elevated the power of speech to majestic heights, but also to a stronger proficiency in using rhetoric in anyone’s day-to-day life. Professor Drout examines the types of rhetoric and their effects, the structure of effective arguments, and how subtleties of language can be employed to engage in more successful rhetoric. Drout also ponders the role of rhetoric in our world and the ageold question of whether it is just a tool for convincing people of things that aren’t true, or whether it is indeed a force for good that will ultimately lead to truth. 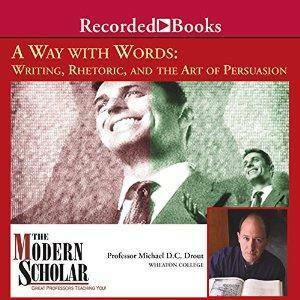 In A Way with Words: Writing, Rhetoric, and the Art of Persuasion, widely published professor Michael D.C. Drout embarked on a thought-provoking investigation into the role of rhetoric in our world. Now, in A Way with Words II: Approaches to Literature, the renowned literary scholar leads a series of lectures that focus on the big questions of literature. Is literature a kind of lie? Can fiction ever be "realistic"? Why do we read? What should we read? Professor Drout provides insight into these and other provocative questions, including those related to the role of the text, author, and audience in the reading process. Throughout, Professor Drout introduces the major schools of literary and critical thought and employs illuminating examples from the world's most important literary works. Literature contributes to our understanding of what it means to be human in a myriad of complex ways, and for all those who appreciate the role of literature in our lives, this course proves a wonderful exploration of one of humankind's most cherished pursuits. 10 - What Is Postmodernism and Why Are People Saying Such Horrible Things About It? 14 - What Do We Talk About When We Talk About Literature? A panda? Or a gunman at a restaurant? The answer to this all depends on—you guessed it—grammar. In the third part of his extraordinary Way with Words series, Professor Drout continues to explore humanity’s intimate association with language, here delving into the finer points of English grammar. Since others judge you by the way you speak, the intricacies of grammar, in fact, should not be relegated to the realm of fussy “guardians of the language,” but are rather essential clues all can employ to communicate more exactly. In such a light, this course forms an invaluable guide for everyone from all fields of interest. Lecture 02 - What Is Grammar? Lecture 10 - Subjects and Predicates and Objects, Oh, My! In A Way withWords I, II, and III, Professor Michael D.C. Drout increased listeners’ understanding of the way literature works, of the rhetoric that in many ways defines people’s lives, and of the intricacies of grammar, all while maintaining a lively tone that conveys the professor’s infectious enthusiasm for the subject. In part IV of this fascinating series, Professor Drout submerses listeners in poetry’s past, present, and future. Addressing such poetic luminaries as Milton,Wordsworth, Shelley, and Keats, these lectures explain in simple terms what poetry is while following its development through the centuries. Lecture 1 What Is Poetry?